Tanzania the land of Police Road Blocks and ridiculous National Park fees. – Crickey…….we're in Africa! On the day we left for Tanzania we got away early just in case we had trouble getting through the border. That was an understatement but not from the Malawi side which went very smoothly but from the Tanzanian side. Getting the visas was quite straight forward for Pauline to organise but getting the carnets signed for the two vehicles by Customs was just horrendous. First they wanted to check every compartment of both the Landcruiser and the Karavan (and I’m talking about maybe 6 of them all wanting to have a gawk inside our vehicle and van) just in case I had any illegal contraband which is their right but not often enforced. However to check the Karavan thoroughly we need to lift the roof and by this time I was getting very hot and bothered but was trying to maintain my cool. So I told a little white lie in that I told them that I was unable to lift the roof if I didn’t have electricity to do this. This seemed to really annoy them and I tried explaining with a big smile on my face that it was just our bedroom and I wouldn’t have any illegal contraband in my bedroom and with that he gave me a snort and promptly turned and walked back into the office. Then they started inputing information into a computer taking at least an hour or more to do so and when nearly finished told me I would have to pay $25 US for each vehicle and I was beyond arguing but just wanted to get out of the heat and chaos. So I pulled out a $100 US bill and asked if they had change to which he replied that no you don’t pay us, you have to go to a bank in the town and pay them and then return with the paper work (obviously they can’t be trusted with taking money and the bank can). Why they couldn’t have told me this an hour ago I’m not sure but anyway off I set into the village in Tanzania with no passport or visa only to be told at the bank that they would need a passport so back to the car I went to get my passport! By this time rivers of sweat are running down my face and back but managed to pay the bill at the bank and return to the Customs office with the paperwork. More endless waiting for my carnets to be signed while the man behind the counter continued to punch away at the keyboard, I had not encountered this before and was mystified as to what he was doing. Finally he had finished and handed over my carnets but with two additional bits of paperwork which turned out to be Temporary Import Permits for both vehicles which if you have carnets you don’t bloody well need! Do I hang around and argue the point with them for another hour and get my $50 back or do I grab the paperwork and run and guess what? I ran! To make matters worse Pauline had been feeling very unwell with a stomach cramps all day and when I told the Customs men that I needed to get her to some medical help it fell on deaf ears. On border crossings you also get harassed by illegal money changers who will tell you all sorts of stories as to why you would need to change some currency such as, you are going to need it for road tolls of which there are none! Anyway if you are polite but firm they will give up after about 10 minutes. A Bob Marley Tuk Tuk! Lots of beautiful hand made baskets. Lots of colour and beauty. We noticed a huge change the minute we entered Tanzania in that it was obviously a more wealthy country with better housing, official buildings and shops. We started to climb the moment we entered Tanzania and continued to do so for over an hour passing big tea plantations and banana plantations. It was very beautiful and almost quite tropical after the dry arid land down below and there was so much to look at. Intensive farming using all available space. The houses were getting better in Tanzania. Very difficult for me to look while at the same time dodging people, bikes, motor bikes and very slow but huge trucks which were everywhere. There was no camping spot for quite some time and so we had to continue on for quite some time before eventually reaching a community camp site on the banks of a beautiful river. We were the only ones there and before long a young 22 year old Matthew came down from the village on his bike and introduced himself as the caretaker. We paid him the sum of $12 Aus and for that we got a beautiful quiet spot with only a drop toilet and no shower but Matthew did insist on collecting firewood for us and then lighting our fire and cleaning the drop loo before he rode home the 6 kilometres in the dark! It was a lovely peaceful night and we went to sleep to the sound of the rapids in the river. We were ip at 6am the next morning and Matthew had walked back already and was cleaning the drop loo and asking if we would like a fire lit! We left at about 7.15am and dropped Matthew back in the village before heading off going north-east on the main road to Dar es Salaam which was full of very slow moving trucks and villages with speed limits of 50 KPH every few kilometres which was so frustrating because there were police road blocks virtually in every town. One such town I was pulled over and told that I had been photographed speeding but I was pretty sure I hadn’t been so asked to see the proof whereby he walked off and came back in a few minutes with a phone and showed me a photo. Sure enough it was me but when I really zoomed in I could see the alleged speed was 50KPH and when I asked what the speed limit was he said it was 50KPH! So I said then I was not speeding was I and he spun on his heels and just walked off waving me to go. Then in another town I was pulled up and the female police officer asked why I had overtaken a vehicle on double lines and when I thought about I realised that she had seen me pass a bus that had just pulled off the road and I may have just gone over the double lines. So I told her what had happened and she not too happily let me go. This is going to be a long slow drive through Tanzania then isn’t it! This was amongst the timber plantations. We do however turn off soon to go through the Selous National Park so will see very few police then. As we drove along this stretch of road we came across an area around Ruaha Mbuyumi that had the most dense area of Baobab trees that we had ever seen. It was quite incredible and this stand of trees went on for 30 odd kilometres. The Baobab trees are certainly not an endangered tree around here! A bigger forest of Baobabs we had never seen. That night we got to a great little lodge called TanSwiss which is named that because the owner is a Swiss man in Tanzania! It was like a little oasis and had a nice quiet camp area but also boasted a terrific swimming pool which we used as soon as we had set up. The next morning it was my turn for the stomach cramps and so we made the decision to stay an extra night before moving on. In the afternoon I was feeling well enough to go for a walk around the village which serves as a stop off point for the truck drivers going through to Dar es Salaam and was really interesting to have a look at. From here we drove another 100 kilometres to Morogoro where as we were driving through a man pointed at our back passenger side wheel and shouted out “flat tyre” and at first I was sceptical because you hear of people using this to get you to stop. However after Pauline lent out the window to have a look, yes indeed we had a tyre loosing pressure so we pulled into a very conveniently located service station to change it. We had no sooner pulled in when about five men came up offering to change the wheel for us and they were so insistent that I ended up letting them do it. They had the job done in no time at all but at all times under my watchful eye to make sure the job was done properly! So how much did they ask for you might ask? The huge amount of 10,000 Tanzanian shillings which works out at $6 Australian and saved me a lot of effort and sweat on a very hot day! The service station had a tyre repair man set up in a corner of their property and he took it away to fix it straight away. The offending piece of metal was prised out and he decided that to be sure he would put a patch and a tube in. I was dubious about it really needing the tube but figured, better to be safe than sorry. This was the first puncture in Africa which is not bad considering we have done 24,000 kilometres on some pretty horrible roads, with a lot of debris on them. Meanwhile as soon also as soon as we pulled up I was swamped by people trying to sell all manner of things and promptly put them over to Mumma (thats what they call Pauline!) and she ended up doing some bartering to get some great fresh fruit and veggies. Again here in Tanzania we are faced with not being able to use credit cards for fuel purchases and to fill my tank it costs 433,800 Tanzanian shillings or around $1.45 per litre! Pauline was blown away by the brick of notes that we got from the bank when we changed some US currency! What was left of the brick of notes we used to get through the Tanzanian border post. Time was ticking away and so we left town with the Selous National Park put into my navigation App called Maps.me and as it is want to do some times it decided to take us the short cut through a fairly densely populated area weaving through very narrow streets and roads but eventually we popped out onto the main road if you could call it that. The short cuts it takes can be very annoying sometimes but other times even though it is a bit stressful we get to see some really fantastic sights. The main road of about 150 kilometres was not much more than a car width in most spots and quite rutted. No passing on this bridge. It was wet and fun on the clay! It was just a succession of small villages all joined together so our speed was never more than 50 kilometres an hour but it was the most enjoyable and interesting drive we have done for a while taking around four and a half hours to cover the 150 kilometres. One particular section there was a lot of huge black boulders but when broken open were a brilliant white rock which they broke up into smaller pieces to sell. We eventually pulled in to the only camp site available in these parts which was a community run camp again. Three men were at the camp when we got there and again we had the use of a tent chalet to use for shower and toilet while we camped beside it. We were the only ones to stay the night and two Masai men slept on mattresses on the floor of the shelter beside us all night apparently to to protect us from what we were not sure! They were great blokes although only one of them could speak a smattering of English. We shared our breakfast of peanut butter on toast with them which they loved! One of the first soccer pitches we saw to actually have grass! Broken up to beautiful white stone. Off we went nice and early to be at the Selous National Park gate as soon as it opened and got there just as the Ranger was opening the building. He then asked to see our permit to which we replied “what permit” because at every National Park we had entered previously we bought our permits at the gate. You must have a permit that is bought prior to making g the trip down he said because we don’t take cash or credit card sales. So faced with a return trip of around 9 hours to get a permit we pleaded with Luderick the ranger to help us out here, so he agreed to call his boss (this was a Sunday). The boss said that she couldn’t make a decision but would call her boss and eventually we were able to pay with a combination of US dollars and Tanzanian shillings. This is where we were in for a hell of a shock because to enter the park and for one 24 hour period as well as camp for the night inter camp which is very, very basic costs $586 Australian. What do you do, it’s obvious that the Tanzanian government is out to make as much as they can out of foreign tourists and this is also roughly what we will be slugged in both the Serengeti National Park and the Ngorogoro Crater each day. We are seriously thinking of not doing the Serengeti and from talking to a lot of other overlanders they have virtually bypassed Tanzania use using it to drive straight through. The Lonely Planet guide talked the Selous National Park up and mentioned that it was only $30US per person per day and I’m sure if we had of known that it was going to cost us $586 per day we would have passed it by. Anyway that took Luderick two and a half hours to sort out and in we went and again like so many other National Parks there are roads and tracks leading off everywhere but no sign post to guide you. Furthermore they don’t even supply you a map for your $586 so again we spent a lot off the day trying to find our camp site so that we could leave the van behind and go in search of animals. That day we took the Karavan through some tracks that were as nasty as I would ever like to take it. Some of the dry creek crossings were so steep going in and out of and then deeply rutted as well that a couple of times I thought the van might roll over. I was also still experiencing stomach cramps so when we eventually found the camp we decided to stop and rest for the afternoon which was a pity. We hadn’t seen much in the way of animals but had seen large herds of Wildebeest and Buffalo. We also saw a huge number of Giraffes many more than in other parks. Lots of Zebra in the Selous National Park . The Warthog in the Selous were quite hairy. The park itself is very beautiful, quite open country with big Thorn trees which of course the Giraffe love. The camp if you can call it that was very basic and looked like it had not been cleaned in weeks not to mention the ablution block having no water at all. No staff are based at the camp and must only come in to clean and fill the water tanks on the odd occasion which for $120 US dollars a day is a bloody disgrace and the Tanzanian Government who are charging these ridiculous fees should hang their heads in shame. On our way out the next morning we drove along tracks that ran along the water holes and saw quite a number of animals and some lovely scenery. When we left the park we were asked to fill in some feedback forms and we really vented so that hopefully someone will take notice and do something about the huge fees and terrible condition of the camp site. The staff on the gate looked like they had heard it all before, were quite embarrassed about it and they wished that there could be a solution because they had seen a marked drop off of visitors to the park since the fees had gone through the roof. Watermelon and Jackfruit for sale. Now we would start the drive towards Dar es Salaam and Zanzibar Island. 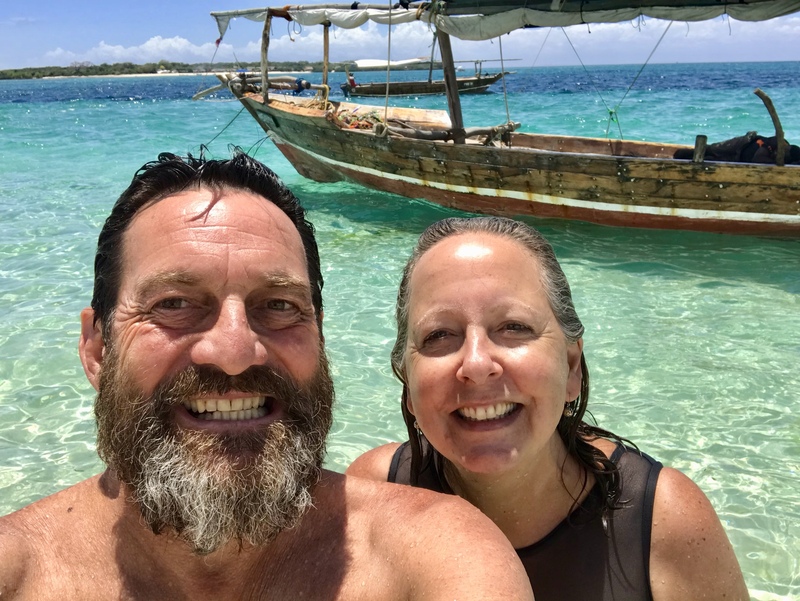 hi guys.. what an interesting story ,, good onya both.. would love to be sharing this stuff with you .. such is life.. brucey..
Gosh what a hassle in Tanzania then the National Park but I am sure it was worth it for the experience. Such wonderful stories you will have to tell your grandchildren. You guys are tough! Gotta take the good with the bad sometimes. True but just hate the way the Tanzanian government is charging the foreigners so much to see the National Parks. Most overlanders who we speak to are passing straight through Tanzania. We couldn’t put it down! Now up to date. Amazing!! Great photos. Truly a life-changing experience. Yes so true, definitely life changing and we’re looking forward to going back in February to finish the trip! Previous Malawi “The Warm Heart of Africa” Part 2. Next Goodbye Karavan and hello Zanzibar.